Priage 6-inch Queen-size Memory Foam Mattress And Box Spring Set. Sleep sound with the comfort and support of this Priage 6-inch memory foam mattress and box spring set. The memory foam conforms to the natural shape of your body with a full support high-density foam base for long lasting durability and stability. The accompanying 9-inch Smart Box Spring offers the look and functionality of a traditional box spring, but is made from steel for longer-lasting durability. Mattress: 6 inches high x 60 inches wide x 80 inches long. Box Spring: 9 inches high x 60 inches wide x 80 inches long. Resistant to dust mites, naturally antimicrobial. Temperature-smart memory foam responds to body heat and movement, reshaping to distribute body weight and relieve pressure points to improve circulation. Arrives tightly packed in portable box for customer convenience. Remove from packaging within 72 hours to maximize expansion. You can sleep on it the same night it is unwrapped, however allow 48 hours to fully return to its original shape. Vacuum sealing sometimes traps odors. After unwrapping, air for a few hours to eliminate trapped odors. Due to machine-cutting manufacturing processes, there may be slight variances in the dimensions of this product. 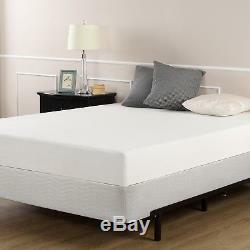 Due to the nature of Memory Foam the firmness level of similar products may produce different firmness results Once opened this product is non-returnable. Conveniently arrives tightly packed in portable box. 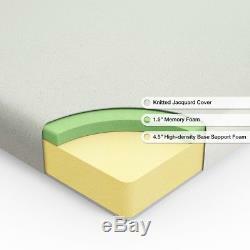 Due to the nature of memory foam, the firmness level of similar products may produce different firmness results. Once opened this product is non-returnable. At Toscano Home Decor we strive to provide our customers with quality products at the best prices possible. Our team conducts business with a spirit of excellence and integrity. We make all efforts to give each customer a level of service that they will never forget, making them want to come back for more. NnIf you are looking for the latest style and fashion for your home this is the store for you. At Toscano Home Decor we offer decor and furnishings for the living room, dining room, bedroom, bath, kitchen, office, entryway, backyard and much more. We look forward to conducting business with you. If ordering electrical items outside of the U. The item and package should be in original and perfect condition. We do our best to process as quickly as possible. Orders are processed immediately and dispatched to fulfillment as soon as they are received. For this reason, we are typically unable to honor cancellation requests. If the order has gone too far through the fulfillment process, we will be unable to cancel. The item "Priage 6-inch Queen-size Memory Foam Mattress And Box Spring Set" is in sale since Monday, September 24, 2018. This item is in the category "Home & Garden\Furniture\Beds & Mattresses\Mattresses".